The abolitionist-women’s rights advocate, Sojourner Truth, was born into northern slavery in upstate New York around 1797. Originally Isabella Baumfree, she spoke the Low Dutch of her “masters”, the Hardenberghs. Auctioned with her family at age nine, she experienced first hand the family break-ups, and fierce, arbitrary cruelty of a system that defined human beings as chattel. By 1826, at age 29, “she walked away” from slavery with her youngest child, having known five “masters”, whippings, deprivation, betrayal, and the selling away of her parents’ as well as her own children. She found shelter and employment with the Van Wagenen family and assumed their name. ​In 1843, at age 46, Isabella Van Wagenen had a divinely inspired vision. 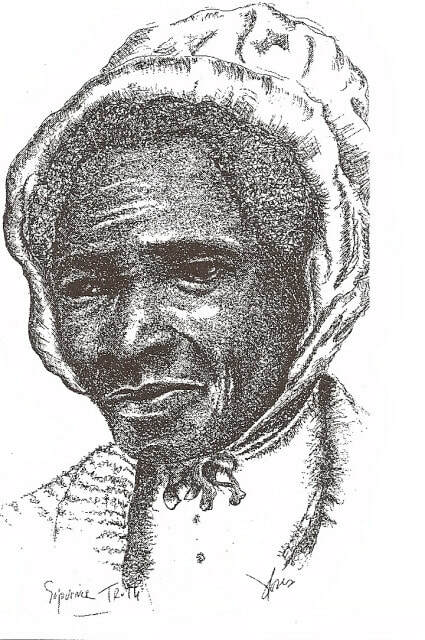 She renamed herself Sojourner Truth, left New York City, and set forth on her life’s work of “testifying of the hope that was in her.” By 1844, Sojourner Truth had given her first anti-slavery speech. Yet unlike many of her formerly enslaved self-liberated African American contemporaries, Sojourner Truth did not become literate. Still, her platform eloquence and oratory were full of mother wit, straightforward examples, wry humor, insight, and targeted Biblical parables; her command of Scripture from memory was formidable. Sojourner Truth was a highly visible, eloquent and moving abolitionist speaker and activist. She was the most powerful African American woman to consistently and publicly link the oppression of slavery with the subjection of women. She spoke at the first national women’s rights convention in 1850, and in 1851, at age 54, delivered a famed speech at the Akron women’s rights convention. Throughout her life, Truth continually reminded her allies that black women were half the slave population, and that without changing the conditions of all women’s oppression, black women would not achieve Freedom. At the outbreak of the Civil War, Sojourner Truth worked to supply troops with needed clothing, blankets, and food, and to recruit African American soldiers for the Union. She worked for the Freedman’s Bureau during the Civil War, aiding the newly emancipated. Her insights proved prophetic in the aftermath of the Civil War. In 1867, Sojourner Truth reminded attendees of the Equal Rights Association meeting that she came “from another field – from the country of the slave” and that“they had to keep the thing going while things are stirring” for “women have no right, no voice, nobody speaks for them.” The women’s rights movement split over the issue of black male enfranchisement. Sojourner Truth attempted to weave the factions together, and was correct in her post-war assessment that not enfranchising African American women would delay Freedom for all women. Sojourner Truth was very clear, very early that legal Emancipation was not full Freedom. Overcoming the challenges of slavery, illiteracy, penury, prejudice, and sexism in her own lifetime, Sojourner Truth worked for Freedom and to end Racism by mobilizing thousands to support abolition, align their Christian faith with anti-slavery activism, and concretize the founding ideals of America in the lives of all.